Any calls on Reliance Infra, Biocon and Sun pharma? Hi seema, no, no breakouts yet. for now best to avoid these. hows HPCL or BPCL for intraday buy? Hi CB sir.. your view on NIITTech 950PE?? What about TataGlobal for intraday? Your view on GRAPHITE india intraday? As its under sebi eyes also Indiaglycols BEPL..
DELTACORP got at 223.2 [ TG-?] or? Hi pappooss, ok. hold with sl near 217 for now. others may remain a bit flat/ weak [ =is it DELACORP you told? sir i bought banknifty 26300 CE 140 LOT AT 159.3, WHAT IS THE TODAY TGT? Hi jessi, can test 26400-26420 it seems. Hi Gokul B, most welcome. Hi Girish, are going a bit weak. avoid for now. Any script for between Rs.10 to 90 for short term investment ???? Can we enter for Mindtree 1040CE and ZEEL 560CE?? 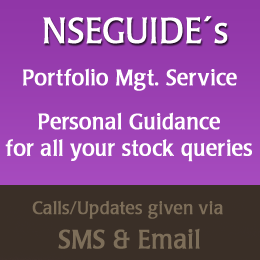 Hi, Bought NBCC jun fut @ 93.3. Its 86.3 now. Can I hold it ? Can i add grauer & weils for short term ?? Can I buy CGPower at this level? Hind is going the other way around. Do u see it heading back? Intraday target for Axis bank. Hi CB sir united spirits for the month target?????? Hi Sir, any good stocks to accumulate at current price for long term? How does Meghmani look at cmp of 84-85/-? Hi Harshal, meghmani is going a bit weak. nothing new for long term yet. I.HAVE 10 LOTS OF BN 26100PE TMRW EXPIRY AT 50..
IS IT SAFE TO HOLD TILL EVENING OR EXIT IN MNG? Hi jessi, Hope u remember me, how are you ? Do u really mean u had entered 140 lots ? u booked profit ? or still holding ? Hi CB, How are you Sirji ? How is Kartik Sir ? At what price tata motor and ashok leyland can be bought ? Rate hike is -ve for banking stocks right? what is your take on Axis and Yes bank for tomorrow? Can i add some anyone script ? Kwality holding 350 shares @ 98 Rs. Any chances for recover in future ?????? Can i add risa international ??? Any penny stocks tips available ??? Hi Robotguy, We are doing fine. How are you? Hope doing good. I shall check into the issue.